Cyclamen mites are tiny arachnids that are oval, translucent white to yellow-green in colour and are 0.25mm in size with six legs for the first nymph and eight legs for the remaining stages. They are very difficult to identify until severe damages occur. Cyclamen mites are mostly found on the base of the plant or near the buds. They prefer darkened humid areas of immature leaves and buds in growing tips. Cyclamen mite eggs take 2-11 days to hatch to nymph and another 4-10 days to develop to adult. Male species are smaller than the female. The females lay their elliptical eggs which are 0.1mm, oval and white either singly or in clusters on buds, leaves or flowers. 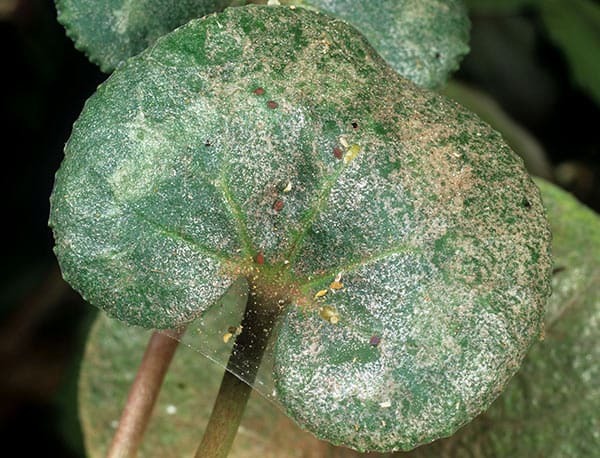 Unlike broad mite eggs cyclamen mites have a smooth surface. Cyclamen mites feed through sucking the cell contents resulting in detrimental damage. Plant symptoms include distortion of the growing tip, resulting in thickening of the meristematic (growing point) tissue. Damages results in the curling up of leaves and blotching with some foliage turning purple in colour. Damaged buds do not develop and plants may not produce flowers or fruits.